Every animal is unique. The price of a dog reflects its genetic heritage, the genetic traits expressed by the dog, and the reputation of the breeder. My Shar-Pei are some of the best in the world, and my prices reflect that. There is no price difference based on size, but rare colors will be priced higher than more common colors. Rescue Cheap or Free. No information on pedigree or genetics. Unplanned Breedings Puppies from individuals or families often have questionable pedigrees and genetics. No guarantees. Hobby/Backyard Breeders With only one or two breeding pairs, dogs are bred indiscriminately, without regard to improving the quality of the dogs or the breed. No guarantees. Puppy Mills These commercial breeders operate much like backyard breeders, but in higher volume. The focus of the breeding program is on quantity and profit. The dogs are often treated very poorly. The combination of low genetic quality from indiscriminate breeding and poor treatment often results in dogs with poor health and bad temperament. Producing these dogs in high volume is damaging to the health and reputation of the breed. Show Kennels These kennels focus on quality over quantity using a technique called line breeding. The best dogs from these kennels compete in dog shows sponsored by the AKC, where they are judged on conformation to the Shar-Pei breed standard. The best of the best can become champions with enough wins. At this level, you begin to get guaranteed replacements for dogs that turn out to have health issues or other problems. 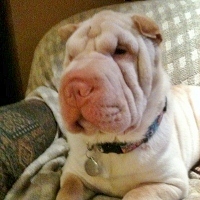 Baggins Shar-Pei Kennel Linda Coffee, the owner and founder, has pursued an extremely selective breeding program for over 30 years. The result is the highly coveted Baggins Bloodline, which has produced over 100 champions so far. The dogs Linda produces today are so consistently good that her pet-quality Shar-Pei (not for breeding) would be the premier show dogs and breeding animals for many other show kennels. In fact, kennels worldwide have come to Linda for animals to improve their bloodlines. These Shar-Pei are the cream of the crop. You will not find better Shar-Pei anywhere on earth.